Dark Made Dawn (2016. 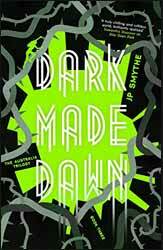 312 pages) is the final book in the Australia Trilogy of young adult novels penned by J P Smythe. The book follows Chan a young female who grew up in the violent society of the prison space ship ‘Australia’. Her escape and what she found on the Earth are detailed in the previous two books. The Earth is not uninhabitable, but it has become a difficult environment to live in with its constant high temperatures. The rise in the seas means that mankind has predominantly retreated to its surviving cities, cities which are tightly controlled by the police and other forces. When the story opens Chan finds herself working for Hoyle, doing the sort of jobs which the police would like to do, but cannot because of the law. Chan’s partner Rex is a constant worry for Chan, not because she is such an expert killing machine, but the way that Hoyle uses her makes it difficult, in Chan’s opinion, for her to find her humanity. The stakes are further complicated as Chan continues to search for others from her ship, especially Mae, the child she rescued from the ship. The book is told from Chan's perspective and consequently we spend a lot of time in her head. As the main driver of the story Chan is a relatable character, even if those around her are less so. Rex is externally emotionally shut off, seemingly uncaring when she hurts or kills others, but Chan is not so sure, believing she detects emotional chinks in Rex’s armour. During the story we discover at least one surprising fact about Rex’s time aboard the Australia and some of the reason for her emotional retreat. Chan’s relationship with Hoyle and Rex is further complicated as Ziegler, a past friend has published her life story, albeit somewhat altered making her a celebratory, something which she uses to fight against Hoyle and find Mae. At times the background to the story seems a little sparse, there is certainly a paucity of description for either Washington or New York, but ultimately this matters little as Smythe is interested in his characters, their development and how circumstances changes even the most intractable soul. If you have read the whole series then you’ll be pleased to discover that not only does it come to a satisfactory end, but that in many ways the end is the beginning.